Kapur Commission Report deals with the Conspiracy to Murder of Mahatma Gandhi who was shot dead point-blank range by Nathuram Vinayak Godse in Birla House Prayer Gardens on 30th January 1948. Three among the eight accused i.e. Madanlal, Karkare, and Gopal Godse were released on12th October 1964 after completion of their life-sentence and honoured on November 12, 1964 in Pune at a private function presided by Dr. G.V. Ketkar. In that function, Delhi and Bombay Civil and Police administration were strongly condemned for their laxity and dereliction of duty which ultimately resulted in the murder of Mahatma Gandhi. The Indian Express dated November 14, 1964 commented adversely about this function. There was a furore in Bombay Legislative Assembly and Indian Parliament which led the instituion of Kapur Inquiry Commission. The Commission’s report was made public in 1970s. This digitised Report in two parts is an indispensable one for Judicial Officers & Police Officials, Lawyers & Students of Legal Studies, Historians & Human Right Activists, and above all for Indian Politicians & Bureaucrats in discharging their official duties without any commission or omission and comprehending the social responsibility that is to be shouldered as and when required in times of crisis. By S. PADMAVATHI and D.G. HARIPRASATH. The first author is Mrs. S. Padmavathi, born on 14th April 1969, belongs to a Tamil-speaking Brahmin family hails from Mahadhanapuram, Karur, Tamil Nadu. She studied Law at Bangalore University and Annamalai University. She is practising Law at Chidambaram Bar. Miss. D. G. Sindhu is her only daughter doing doctorate in Mathematics in Annamalai Varsity. Mr. D.G. Hari Prasath is the author’s only son. She along with her husband Mr. Z.Y. Himsagar, who is related to the acclaimed Tamil Writer and Critic Ka.Naa.Subramaniam @ K.N.S. @ Ka.Naa.Su. has authored many political history books and a tamil short-story book entitled “Mahadhanapuram Railway Gate”. The second author is Mr. D.G. Hari Prasath, a Senior Law Student at School of Law, SASTRA University, Tanjore. He is adept in Carnatic music and music instruments.He is a wide traveller having visited Bangalore, Benares, Calcutta, Delhi, Gaya, Hyderabad, Mumbai, Trivandrum and also Nepal.He has played vital part in digitizing and annotating the Kapur Commission Report. 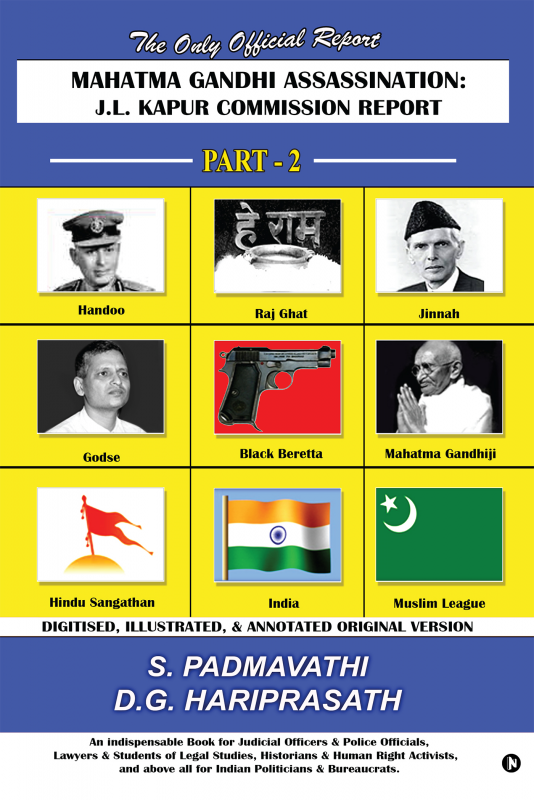 “Assassination of Indira Gandhi: The Crime and The Trial” “Assassination of Rajiv Gandhi: The Crime and The Trial”, “Assasssination of Mahathma Gandhi: The Crime and The Trial” (in Tamil) are her forthcoming works through NotionPress.Com of India.